Rub chicken breast halves with ginger. Spray large nonstick skillet with nonstick cooking spray. Heat over medium-high heat until hot. Add chicken; cover and cook 8 to 12 minutes or until chicken is fork-tender and juices run clear, turning once during cooking. Meanwhile, in small microwave-safe bowl, combine all remaining ingredients; blend well. Microwave on HIGH for 1 1/2 to 2 minutes or until sauce has thickened. To serve, spoon sauce over chicken. If desired, serve with lemon slices and green onions. 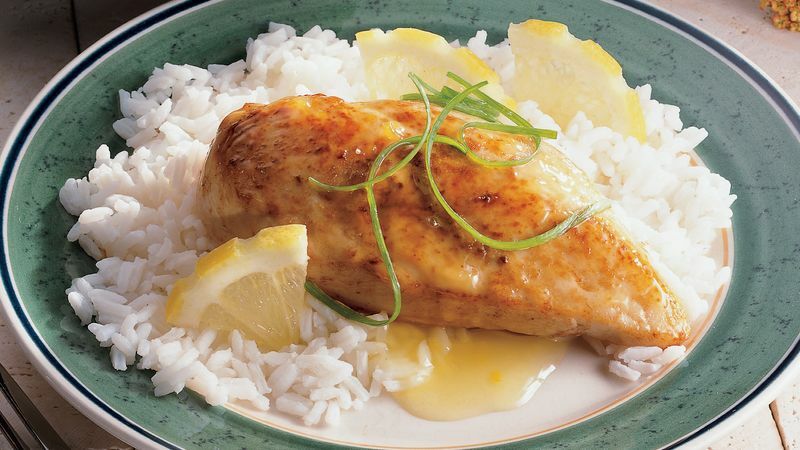 Sautéing the chicken breasts in ground ginger gives this dish a pungent ginger flavor. Garnish this recipe with lemon slices and green onion brushes. To make the brushes, see the Make It Special note on page 83. Leftover Lemon-Ginger Chicken makes an excellent cold Asian salad. Slice the chicken and serve it over mixed greens; make a dressing using rice vinegar, soy sauce, minced green onions, sesame oil and a pinch of sugar. Sprinkle toasted sesame seed over the salad.